A trustee is pleased with the timing of the bond issuance. The Alamo Colleges board of trustees discussed the results of a privately conducted survey during the board meeting May 16, which they refuse to release to the public. The Friends of Alamo Colleges political action committee commissioned and paid for the survey. Board Chair Yvonne Katz, District 7 trustee, said she wanted to present the survey results sooner but could not until the election was over. 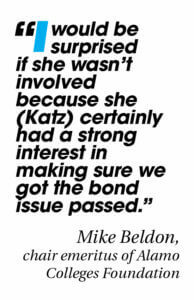 Katz said 73 percent of people surveyed supported the $450 million bond issue passed May 2017, and she said people became supportive of the bond after hearing more information. According to the Bexar County voting results, 67 percent of voters supported the bond issuance and 33 percent voted in opposition. The results state that 112,405 county residents voted on the bond issue, with 75,123 voting in favor and 37,282 voting in opposition to the bond. According to the Bexar County Elections Department website, there are more than 1,049,400 registered voters in the county. Katz said she knew how many people were surveyed but would not release the information in an interview May 26. In an interview Nov. 8, Katz estimated there were about 400-500 people surveyed. In an interview Nov. 3, District 1 trustee Joe Alderete said he didn’t understand why Katz would not provide the information, saying the information should be made public under the Texas Open Meetings Act because some of the information was divulged at a board meeting. In an interview Nov. 8, Katz said the survey was proprietary information for the specific-purpose committee, saying she already said the survey would not be released but she could provide a few pieces of information about it. The Ranger submitted an information request for the survey Oct. 19. Another board source said 350 people were surveyed, which leaves the survey with an approximated 5.3 percent margin of error. In an interview May 31, David Crockett, chair of the political science department at Trinity University, said four-digit numbers are ideal for a sample size intended to represent Bexar County. Crockett said a margin of error of 3 or 3.5 percent is ideal, saying he has seen polls conducted with margins of error as low as 2.5 percent and as high as 4.5 percent. In an interview Nov. 3, District 1 trustee Joe Alderete said he did not have a copy of the survey because he was not worried about it. Alderete said he knew Katz and District 6 trustee Gene Sprague were involved with the specific-purpose committee. Mike Beldon, chair emeritus of Alamo Colleges Foundation, was the treasurer of the specific-purpose committee. Beldon said he was tangentially involved with the survey and the specific-purpose committee because he was diagnosed with bladder cancer, but he said it was feasible for Katz to be involved. “I would be surprised if she wasn’t involved because she certainly had a strong interest in making sure we got the bond issue passed,”Beldon said. Beldon said he sent all pertinent information from the committee to William Raba, president and vice chairman of the board for Raba Kistner, an engineering services firm. At an Oct. 18 Capital Improvement Plan celebration, Raba detailed his relationship with Katz, mentioning the two have worked together. According to the U.S. Census Bureau, Bexar County had a population of 1.9 million after the July 2016 federal census. A 95 percent confidence level, the industry standard for polling, and a 3 percent margin of error would require the board to survey 1,067 residents to accurately represent the opinions of Bexar County residents. 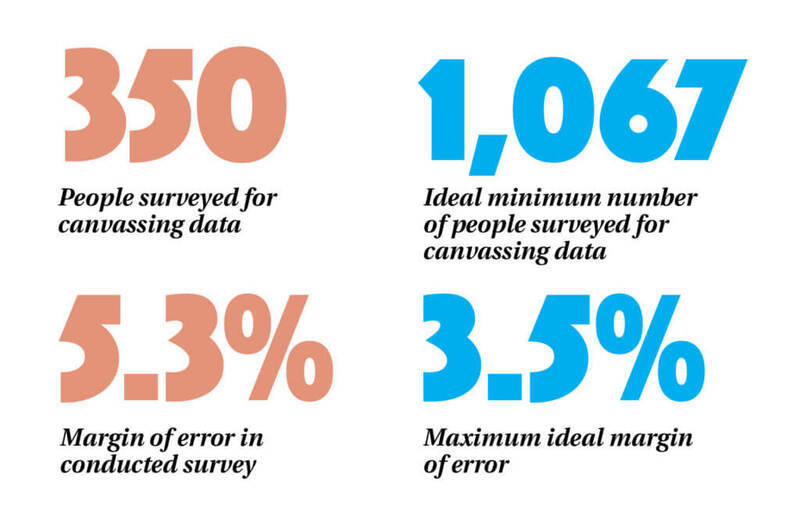 A 2 percent margin of error would require that 2,399 residents be surveyed. District 5 trustee Roberto Zarate said a public relations firm was hired by a political action committee to conduct the survey. According to the Friends of Alamo Colleges PAC political expenditures, the specific-purpose committee spent $24,165 on polling of $197,200 raised in political contributions. Several of the architecture firms contracted with the district for the Capital Improvement Plan projects donated to the specific-purpose committee. Ford, Powell & Carson Architects and Planners Inc., the district’s top-rated architecture firm, contributed $1,000; Alamo Architects contributed $3,000; O’Connell Robertson contributed $3,700; and Pfluger Architects contributed $2,000. The district’s highly skilled workforce programs and graduation rates were important to the people surveyed, Katz said; For instance, the age of facilities in the district was a concern for the people surveyed. Katz said the college presidents had a 70 percent credibility rating with the citizens in the community, saying the presidents are like principals of other school districts because people don’t know whom the superintendents are, but they know the principals. Katz said the board of trustees had a 70 percent positive credibility rating among the people surveyed. Katz said 54 percent of people surveyed viewed the chancellor credibly but only 6 percent of people surveyed knew who the chancellor is. Alderete thanked Leslie and the college presidents and staff for their efforts and commended the board on their timing in holding the bond election. In an interview with The Ranger May 16, Leslie said Alderete’s statement was in reference to Senate Bill 2, which would have limited the district’s taxing power. The bill would have increased the right of taxpayers to ratify the operation and maintenance tax rate. The law currently states that an operation and maintenance tax increase of 8 percent would allow the public to petition to vote on the tax rate. The bill was on the agenda for the special legislative session but did not pass in the Texas House of Representatives. Board members have expressed concern that the legislation will be on the agenda for the 2019 Texas legislative session.